Once upon a time, while browsing the bookshelves at a Barnabite house, I came upon a very worn, pocket-sized book. 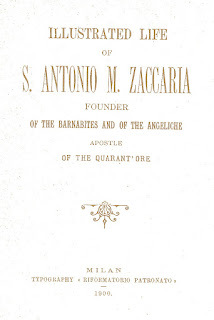 It was Illustrated Life of St. Antonio M. Zaccaria; Founder of the Barnabites and of the Angeliche, Apostle of the Quarant’Ore (the original title). This 16th-century zealous priest and founder of the Barnabites, the Angelics, and the Laity of St. Paul. Anthony Mary was canonized in May 27, 1897 and the book was published in 1900. It was then translated from Italian into English. What is astonishing is that the book was in print over one-half-century even before the arrival of the Barnabites to the English-speaking world. The pages that you are about to read are the contents of that small book. What a treasure! Great things sometimes do come in small packages. The language used in the original translation was typical of the 19th century. Therefore, some words and phrases have been edited into a more contemporary phraseology. Editing the An illustrated Life of St. Anthony M. Zaccaria: Founder of the Barnabites and of the Angelics and Promoter of the 40 Hours Devotion was, indeed, a journey in itself. Along the way, I was blessed to meet friends, namely: Angelic Sister of St. Paul, Sr. Rorivic Israel, ASSP, Miss Fran Stahlecker and Barnabite Confrere, Fr. Richard M. Delzingaro, CRSP. Their heartfelt contributions led me to the gratifying completion of this project. Fr. Robert B. Kosek, CRSP, Ph.D.